The Hive Honey Shop Honeys are on display in the newly refurbished Summer House at Buckingham Palace. The Royal Warrant Holders are holding a special three day event to celebrate the end of the Queen Elizabeths Coronation Festival. 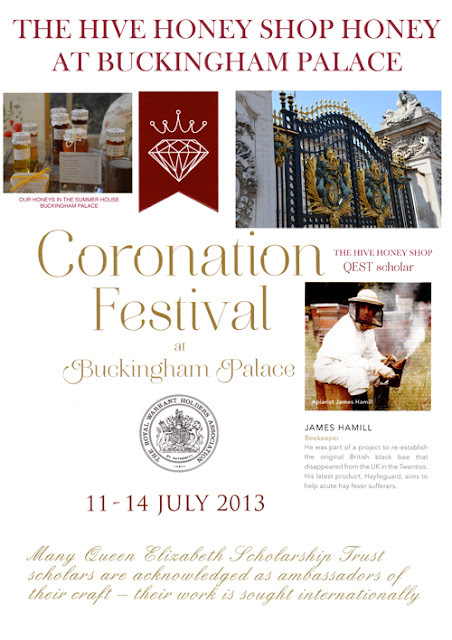 James, head beekeeper for The Hive Honey Shop and Queen Elizabeth Scholar was invited to Buckingham Palace on July 11th for a afternoon of events and again for an evening gala featuring performances from Katherine Jenkins, National Ballet and many more. ‘A massive stage with amazing lights and sound set up was erected at the back of Buckingham Palace gardens. There were two giant screens on each side of the stage but as I sat so close it was not necessary. I had to pinch myself- here I was sitting in Buckingham Palace gardens watching some of the finest performers in the world with the Queen and royal family sitting a distance behind me. It was a beautifully warm sunny day. As the orange sun slowly set, casting a warm glow over the detailed sandstone carving of this majestic building, champagne glass in hand, listening to Dame Kiri Te Kanawa sing the national anthem, a tiny voice in my head said- remember James you’ve got 40 beehive that need cleaning in the morning- but not bad for a beekeeper though‘!